I replied @kenchawkin Wow! What a metaphor for turning obstacles into opportunities. Life’s lessons build character. I thought about it and made it into a haiku, then a tanka, and sent it as another reply to his tweet. I also thought it was appropriate for a piece of Japanese pottery to have inspired a poem in one of the forms of Japanese poetry. I don’t speak Japanese but am reading kintsukuroi as having five syllables. 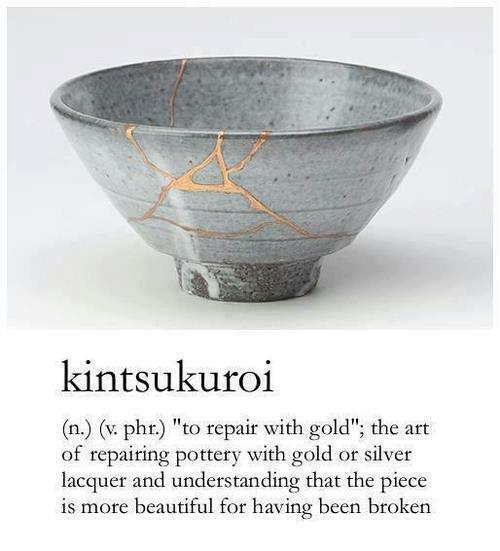 Here is a link to Wikipedia explaining kintsugi or kintsukuroi. Read the explanation under the picture of the piece of pottery, then the poem. Robert Yellin was featured on this blog before. See Takumi is not ‘lost in translation’ in this beautiful film about Japan’s diverse artisan tradition. Speaking of cracked things, Leonard Cohen said there’s a crack in everything–how the light gets in. It came thru him & lit up a broken humanity.